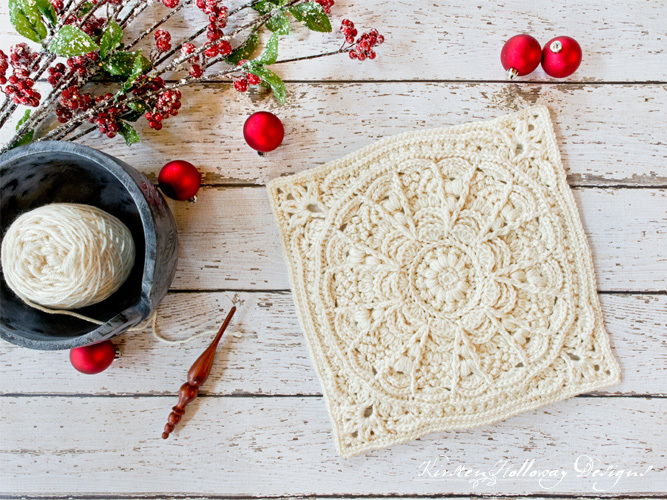 This beautiful crochet granny square pattern creates a thick, sturdy block, which will make such a warm addition to your next blanket or afghan. It is so bursting with texture. However, no two rounds are the same. So, this is a challenging, yet fun square to crochet. This granny square pattern was designed for the Creative Crossings Sampler Blanket to begin with. However, it would also make a stunning blanket by itself. Because it’s so textured, it looks amazing either in one single color, or in several different ones. I used Red Heart Soft yarn because it has a nice drape, and feels amazing! You may substitute other worsted weight yarns, but you may not end up with the same effect. It is important to remember this is an intermediate/advanced level pattern and you will need to be comfortable making front and back post stitches, as well as puffs, clusters, shells and picot single crochet stitches. 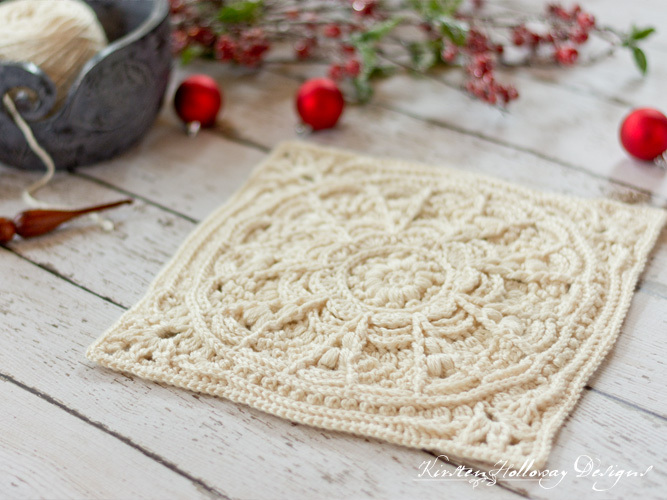 While there, you can also purchase a printable, ad-free PDF of this granny square pattern, if you like. This square will not always lay flat as you are working it, although it does flatten out in the end and a bit of light blocking should fix any wobbly edges. The square pictured has not been blocked. This is an intermediate/Advanced level square, but the texture repeats should be fairly intuitive after you complete the first repeat section of a round. Take it one comma at a time if you get stuck. Your project will start to pucker a bit after this round, but we’ll flatten it out in a few rounds. Take a moment to assess your work, because your project should be starting to flatten out at this point. Fasten off and then weave in ends. 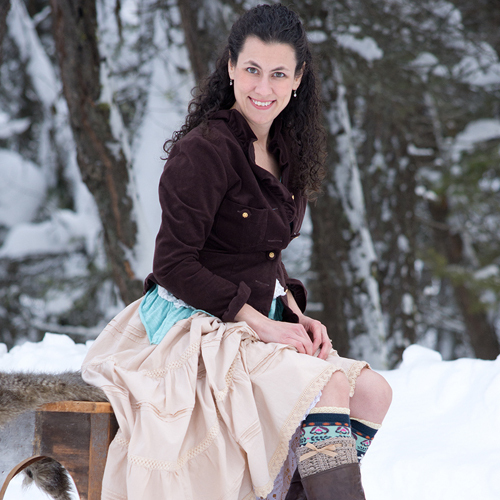 Friends, if you enjoyed this pattern, then don’t forget to sign up for my newsletter! That way you’ll never miss out on special events, or freebies I’m offering. Although you are welcome to share the link to this pattern, using one image of your choice, on your site, please do not share the written patterns themselves, or use additional images. Also, you never have permission to use my images by themselves on Pinterest,. However, they may be included in a roundup pin if there are 4 or more other patterns. If you sell finished items online, then please do not use my pictures for your listings. I’m positive that your work is of high enough quality for you to sell the finished piece. So, have confidence in your abilities! <3 Thank you! This granny square pattern was made to be used by individuals, and also small business crocheters. So, selling your finished pieces in boutiques, at farmer’s markets, craft shows and other events is encouraged! However, the only thing I require is that it not be used commercially to produce millions of copies. This granny square pattern post contains affiliate links. When you purchase something using these links a small amount of the sales price goes to me. However, you do not pay any extra for the item you purchase. How cool is that?! You’re welcome, Heidi! I hope your Thanksgiving was nice as well! This is Gorgeous!! Thank you so much for sharing. Your square is amazingly beautiful. I will give it a try when my skills improve. Thank you for sharing your lovely pattern. absolutely stunning – thank you! i jumped over to the afghan and that’s equally beautiful. any chance you know when pat dunnell’s square will be released? thanks, again! thanks so much! i’ve got 2 lapghans to donate so i was thinking about your square and hers. heading to the homestretch with only a few hiccups – and will be holding my breath thru round 21! Round 21 is the most complex in this whole pattern. What are you having difficulty with? Taking things one comma at a time may help. Those are tricky, and I dont know how to explain it better than the way it’s written. You’ll be working the first tr and last tr in the corner around the tr stitches from round 19, and the rest of the tr2tog stitches in the ch-1 sp. Taking the instructions one comma at a time will help. That and looking at the picture. 🙂 This part is worked over top of the tr clusters to create more texture. I finally got it!!! Beautiful square-great design. Fantastic! I’m glad to hear that, Kat! Round 21 was tricky. Reading your comments “This part is worked over top of the tr clusters” was exactly what I needed to know. That clarified it as I couldn’t understand the pattern alone. Thank you!! So glad it helped, Hallie! I adore this pattern. Thank you so much for for sharing. How much yarn does one square use? I’m trying to plan for a blanket. Each square will take approximately 250-260 yards of worsted weight yarn. 🙂 This could vary slightly based on your tension though. Beautiful!!! Consider myself a high end beginner, but maybe some day I’ll be able to make this. Thank you, Ann! Keep up the practice and you’ll definitely get there! I was able to finish this square, and it is so beautiful, but the rounds following the picot sc rounds (round 5, and 14-16) were a bit confusing for me. Do you work some of the sc into the chain 3 space from the picots? That’s what I did, and it seems like it was just added bulk to that round, but it could be added texture too. This square has so much texture, I did have fun with it, even with the tricky corners on round 21! I started this beautiful square today and love the way it looks, but I can’t work out what you mean on row 8. Do you have a clip to show how it’s done? I do not have any videos for this square. If you have made multi-layered flowers before this is similar. You will be creating ch-5 spaces to work petals in on the next round. You will be slip stitching around the BPsc sts you made in round 6. The pattern gives you an idea of where to place the slip stitches so they fall in the proper place: between the petals or shells you made in round 7. Yes, it was intentional. 🙂 This made the square more balanced in my opinion. I’m glad you enjoyed the square!